"Eli Fields, 2003.08.769, Burial 3" by Timothy K. Perttula and Robert Z. Selden Jr.
DECORATION (INCLUDING MOTIF AND ELEMENTS WHEN APPARENT): The rim has horizontal brushing marks with three rows of tool punctates: under the lip, mid-rim, and at the rim-body juncture. The vessel body has seven panels defined by vertical appliqued fillets that extend to the base. The panels are filled with diagonal brushing marks. 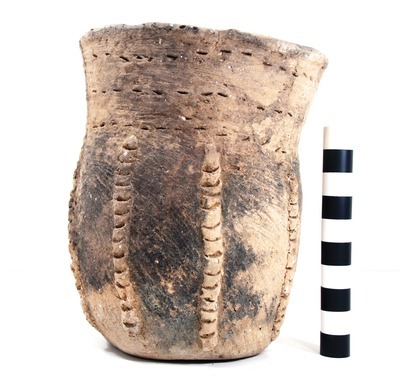 Pease Brushed-Incised jar, Burial 3, Eli Fields site.